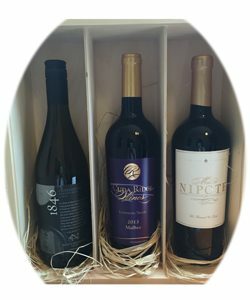 This unique gift box features three Gold Medal-winning Livermore Valley wines in the 2016 San Francisco Chronicle Wine Competition; packed in a natural pine wooden box with the Livermore Arts Bankhead Theater logo. Includes one bottle each of Mia Nipote 2012 Cabernet Sauvignon, 1846 by Nottingham Cellars 2014 Chardonnay, and Cuda Ridge Wines 2013 Malbec. All proceeds support the LVPAC Education Fund. Purchase must be picked up at the Bankhead Theater lobby between 12 noon – 6 pm.